The Seneca are a group of indigenous people native to North America. They are the westernmost Nation within the Six Nations or Iroquois League. Approximately 15,000 to 25,000 Seneca live in the United States and Canada, on and off reservations around Buffalo, in Oklahoma and near Brantford, Ontario. 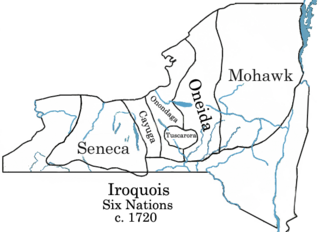 The Seneca were one of the five original tribes of the Iroquois Nation, a powerful and united confederacy formed prior to the arrival of Europeans in the area around New York State. The Iroquois Nation consisted of the Cayuga, Mohawk, Oneida, Onondaga, and Seneca; they were later joined by the Tuscarora. In many ways, the constitution that bound them together, The Great Binding Law, received by the spiritual leader, Deganawida (The Great Peacemaker) and assisted by the Mohawk leader, Hiawatha (Ayonwenteh), was a precursor to the American Constitution. In the later centuries following the arrival of Europeans, Handsome Lake another Seneca spiritual leader, united the teachings Jesus with Iroquois beliefs. His teachings are still followed today, known as the Longhouse religion. The Seneca, or Onödowága (meaning "People of the Great Hill"), traditionally lived in what is now New York between the Genesee River and Canandaigua Lake, with some recent archaeological evidence indicating that they lived all the way down to the Allegheny River into what is now upper North Western Pennsylvania. With the formation of the Haudenosaunee ("People of the Long House") or Iroquois Confederation in 1142, the Seneca became known as the "Keepers of the Western Door" because they settled and lived the farthest west of all the Nations within the Haudenosaunee. The Senecas were by far the most populous of the Haudenosaunee Nations, with the ability to raise over ten thousand warriors by the seventeenth century. The constitution of the Iroquois Confederacy, known as the Gayanashagowa (or "Great Law of Peace"), was recorded with the help of a memory device in the form of special beads called wampum that have inherent spiritual value (wampum has been inaccurately compared to money in other cultures). Most anthropologists have traditionally speculated that this constitution was created between the middle 1400s and early 1600s. However, recent archaeological studies have suggested the accuracy of the account found in oral tradition, which argues that the federation was formed around August 31, 1142 based on a coinciding solar eclipse. By 1677, the Seneca and the Iroquois Nation formed an alliance with the English through an agreement known as the Covenant Chain. Together, they battled the French, who were allied with the Huron, another Iroquoian people but a historic foe of the Confederacy. The Seneca were at the height of their power in the seventeenth century. They benefited by the League traditions which allowed for the dead to be symbolically replaced through the "Mourning War," raids intended to seize captives to replace lost compatriots and take vengeance on non-members. This tradition was common to native people of the northeast and was quite different from European settlers' notions of combat. As members of the League, the Seneca engaged in a series of French and Iroquois Wars. They attacked New France and their Iroquoian-speaking Wyandot ("Huron") allies. They also put great pressure on the Algonquian peoples of the Atlantic coast and what is now boreal Canadian Shield region of Canada. During the American Revolution they fought with the British against the colonies. During the seventeenth century, they are also credited with having conquered and/or absorbed the Neutral Indians and Erie Tribe to the west as a way of controlling the fur trade, even though other reasons are often given for these wars. On November 11, 1794, the Seneca (along with the other Haudenosaunee nations) signed the Treaty of Canandaigua with the United States and later the Treaty of Buffalo Creek. The Seneca formed a modern government, the Seneca Nation of Indians, in 1848, but the traditional tribal government still governs the Tonawanda Band of Seneca Indians. The Seneca cultivated crops in New York from the period around 800 C.E. Traditionally, the Seneca Nation economy was based on the cultivation of corn, beans, and squash. These vegetables were the staple of the Haudenosaunee diet and were called "the three sisters." Seneca women generally grew and harvested the three sisters, as well as gathered medicinal plants, roots, berries, nuts, and fruit. Seneca women held sole ownership of all the land and the homes, thus the women also tended to any domesticated animals like deer, dogs, and turkeys. Women were in charge of the kinship groups, called clans. The woman in charge of a clan was called the "clan mother." Despite the prominent position of women in Iroquois society, their influence on the diplomacy of the nation was limited. Although older women could lobby and pull some strings behind closed doors, the official decisions were made by the men. Seneca men were generally in charge of locating and developing the town sites including clearing the forest for agriculture. Seneca men also spent a great deal of time hunting and fishing. This activity took them away from the towns or villages to well known and productive hunting and fishing grounds for extended amounts of time. These hunting and fishing locations were well maintained and not simply left to grow as "wild" lands. Seneca men maintained the traditional title of War Sachems within the Haudenosaunee. A Seneca war sachem was in charge of gathering the warriors of the Haudenosaunee and leading them into battle. The Seneca recognized an "earth holder" as well as other animate and inanimate objects and natural forces of a spiritual nature. Festivals were held to honor maple sap and strawberries. In the winter, an eight-day celebration was held to give thanks and to forgive wrongs that occurred during the past year. Medicine groups such as the False Face Society danced with wooden masks. Illness was thought to be caused by spiritual influences. A sick person received dances and songs to be performed in their dreams. Shamans were adept at using as many as 200 medicinal herbs to assist with healing. In the early nineteenth century, there was a period of spiritual change called the Second Great Awakening. Handsome Lake drew many of the Iroquois people to his teachings at that time. Handsome Lake or Ganioda'yo (1735 – 1815) was half-brother to Cornplanter, an influential Seneca leader. Before his emergence as a prophet, Handsome Lake fought in Pontiac's Rebellion (against the British) and the American Revolutionary War (against the Americans). After struggling with alcoholism and an apparently near-fatal illness in 1799, Handsome Lake began professing instructions he had been given in a series of three visions. 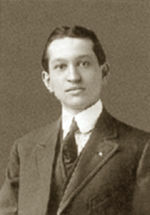 Handsome Lake's teachings were both a revival of traditional religious practices as well as a program of cultural adaptation to the realities of reservation life in the United States. While he encouraged the adoption of certain customs of white Americans, such as European-style farming and housing, Handsome Lake also urged his followers to continue to practice traditional American Indian ceremonies. He encouraged Christian-style confessions of sin and urged Native Americans to stay away from alcohol. In addition to his moral instructions, Handsome Lake delivered a series of prophecies about the end of the world and the signs that would signal it. In 1802, Handsome Lake traveled to Washington D.C. with a delegation of Iroquois representatives to speak with President Thomas Jefferson about land issues and other matters. President Jefferson's approval of Handsome Lake's teachings was an important early endorsement of the prophet's religious movement. Handsome Lake had a good relationship with the Quakers who lived among the Seneca and encouraged them to become farmers, since the Quakers were religious pluralists who agreed with a number of Handsome Lake's teachings, especially his stance against alcohol. Similarly, Handsome Lake did not discourage Indians who chose to embrace Christianity. Christian missionaries among the Seneca after Handsome Lake's lifetime, who (unlike the Quakers) actively sought to convert the Indians to Christianity, were less tolerant of the religion of Handsome Lake's followers. Handsome Lake encountered controversy when he accused a number of American Indian women of witchcraft; several of these women were executed by Handsome Lake's followers. When an accused witch was killed in 1809, Handsome Lake fell out of favor with Cornplanter and the Quakers, although he still retained a circle of loyal followers. Handsome Lake's teachings, known as The Code of Handsome Lake, eventually were incorporated into the Longhouse religion, which is still followed today. In the last years of his life, Handsome Lake advised against Iroquois involvement in the War of 1812. However, by this time many Senecas, including Cornplanter, considered the United States to be their country, and so they enlisted in the war. Handsome Lake gained a wide following, aided by the prominence of his half-brother Cornplanter. Red Jacket (known as Otetiani in his youth and Segoyewatha after 1780) (c. 1750–January 20, 1830) was a Seneca chief of the Wolf clan. and orator He was born near present day Geneva, New York and lived much of his life in Seneca territory in the Genesee River Valley. 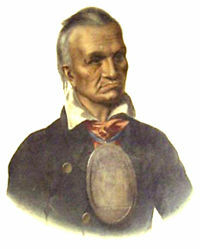 Although they often met together at the Long House, he and Mohawk chief Joseph Brant were bitter enemies and rivals. He also disliked and dismissed Handsome Lake, and led a rival faction of Senecas. Red Jacket took this name, one of several, for a highly favored embroidered coat given to him by the British for his wartime services. The Senecas took the British side during the American Revolution, a costly mistake, since their ally lost. In the War of 1812, Red Jacket supported the American side. Red Jacket was also known for his skill at oratory. His alternative name, Segoyewatha, roughly translates he keeps them awake. He is best known for his response to a New England missionary (a Mr. Cram) who had requested in 1805 to do mission work among the Senecas. Red Jacket's famous speech, as an apologist for the Native American religion, was called Red Jacket on Religion for the White Man and the Red. In it, Red Jacket referred to God as "the great spirit" and identifies the great spirit simultaneously as the Christian God. He posed a series of questions about the validity of the Bible and argued that the Great Spirit had different designs for his white children and for his red children when it comes to the practice of religion. About 7,800 Seneca people are citizens of the Seneca Nation of Indians. These enrolled members live or work on five reservations in New York: the Allegany (which contains the city of Salamanca), the Cattaraugus near Gowanda, New York, the Buffalo Creek Territory located in downtown Buffalo, NY, the Niagara Falls Territory located due east of Niagara Falls, and the Oil Springs, near Cuba, New York. Few Seneca reside at the Oil Springs, Buffalo Creek, or Niagara Territories due to the small amount of land present. Another 1,200 or more Seneca people are citizens of the Tonawanda Band of Seneca Indians and live on the Tonawanda Reservation near Akron, New York. Other Seneca descendants are members of the Seneca-Cayuga Tribe of Oklahoma near Miami, Oklahoma, plus a considerable number are citizens of Six Nations and reside on the Grand River Territory near Brantford, Ontario, Canada. The Seneca have been involved in various land actions. They were unsuccessful in preventing the flooding of Seneca land for the construction on the Kinzua Dam in 1965. Some of the flooded lands were sacred; including the original gravesite of Cornplanter. More successful were negotiations regarding the land on the Seneca reservation upon which the city of Salamanca is located. Lease terms more favorable to the Seneca were negotiated in 1991. However, a lawsuit filed in 1993, claiming that New York State had illegally obtained land in western New York from the Senecas in 1815 without federal approval, finally proved unsuccessful. The Senecas have a diversified economy that relies on construction, recreation, tourism, retail sales, and have recently become involved in the gaming industry. Many Seneca people are employed in the local economy of the region as professionals, including; lawyers, professors, physicians, police officers, teachers, social workers, nurses, and managers. Several large construction companies are located on the Cattaraugus and Allegany Territories. There are also many smaller construction companies that are owned and operated by Seneca people. These companies do sophisticated work like building bridges or large buildings all the way down to pouring sidewalks and building sheds. A considerable number of Seneca men work in some facet of the construction industry. Recreation is one component of Seneca enterprises. The Highbanks Campground plays host to several thousand visitors every summer, as people take in the scenic vistas and enjoy the Allegheny Reservoir. Several thousand fishing licenses are sold each year to eager non-Seneca fisherman of trout, salmon, walleye, muskelunge, pike, bass, and perch. Many of these customers are tourists to the region. Tourisms in the area often comes as a direct result of several major highways adjacent or on the Seneca Nation Territories that provide ready accessibility to local, regional, and national traffic. Many tourist visit the region during the dazzling color display during the autumn season. A substantial portion of the Seneca economy revolves around retail sales. From sports apparel to candles to artwork to traditional crafts, the wide range of products for sale on Seneca Nation Territories reflect the diverse interests of Seneca Nation citizens. The price advantage of the Senecas' ability to sell tax-free gasoline and cigarettes has created a boom in their economy, including a number of service stations along the state highways that run through the reservations as well as many Internet cigarette stores. This, however, has raised the ire of two groups: non-Indian service stations that cannot compete because of New York's high cigarette and gasoline taxes, and the State of New York, whose attorneys maintain that the Internet cigarette sales are illegal and that the State still has authority to tax non-Indians who patronize Seneca businesses, a principle that the Senecas have vehemently rejected. The Seneca Nation began to develop its gambling industry during the 1980s when bingo was introduced. In 2002, the Seneca Nation of Indians signed a Gaming Compact with the State of New York to cooperate in the establishment of three class III gambling facilities (casinos). The Seneca Nation owns and operates two casinos: one in the city of Niagara Falls, New York called Seneca Niagara and the other in the city of Salamanca called Seneca Allegany. The third, the Seneca Buffalo Creek Casino, is under construction in downtown Buffalo adjacent to the HSBC Arena, although it has faced opposition from local groups. 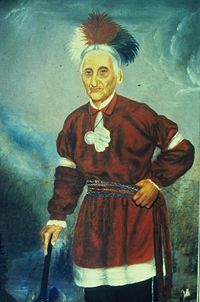 Red Jacket (known as Otetiani in his youth and Segoyewatha after 1780) (c. 1750–January 20, 1830) was a Seneca chief of the Wolf clan. He was a signatory along with Cornplanter and fifty other Iroquois, of the sale of most of the Seneca land in western New York for $100,000 to Robert Morris. He originally tried to prevent the sale, but was not able to convince the others, and gave up his opposition. 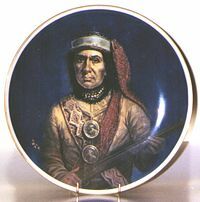 Cornplanter (Gaiänt'wakê or Kaintwakon) (c. 1750–1836) was a Seneca chief, half-brother to Handsome Lake, and uncle to Governor Blacksnake, a Seneca warchief. Cornplanter took it upon himself to understand the ways of the white men as he saw it necessary for future relations between the Haudenosaunee and Americans. He was particularly impressed by the beliefs and practice of the Quakers, and invited them to educate his son and develop schools. Eventually, Cornplanter became disillusioned with his relationship with the Americans. What he felt was increasingly shabby treatment of his people confirmed for him Handsome Lake's warning that they should return to tradition and turn away from assimilation to white ways. 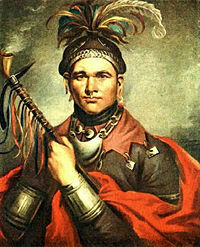 Guyasuta (c.1725–c.1794) was an important leader of the Seneca people in the second half of the eighteenth century, playing a central role in the diplomacy and warfare of that era. At the outset of the American Revolutionary War, the American revolutionaries attempted to win Guyasuta to their cause, but like most Iroquois, he sided with the British, taking part in the Battle of Oriskany. After the war, the aging Guyasuta worked to establish peaceful relations with the new United States. Handsome Lake or Ganioda'yo (1735 – 10 August 1815) was a Seneca religious leader of the Iroquois people. He was also half-brother to Cornplanter. After struggling with alcoholism and an apparently near-fatal illness in 1799, Handsome Lake began professing instructions he had been given in a series of three visions. Handsome Lake's teachings, known as The Code of Handsome Lake, eventually were incorporated into the Longhouse religion, which is still followed today. Ely S. Parker (1828 – August 31, 1895), (born Hasanoanda, later known as Donehogawa) wrote the final draft of the Confederate surrender terms at Appomattox in the American Civil War. Later in his career Parker rose to the rank of Brigadier General, a promotion which was backdated to the surrender. Governor Blacksnake also known as Chainbreaker and Tah-won-ne-ahs (c.1760 - 1859), was a Seneca warchief of the Wolf clan, who, along with other Iroquois leaders (most notably Joseph Brant), fought on the side of the British during the American Revolutionary War. Afterwards, he became reconciled to the outcome of the war and fought on the American side in the War of 1812. Cornplanter was his uncle, and Handsome Lake his nephew. Half-King Tanacharison or Tanaghrisson (c. 1700? – 4 October 1754) played a pivotal role in the beginning of the French and Indian War. He was known to European-Americans as the Half King, a title also used to describe several other historically important American Indian leaders. Little Beard Si-gwa-ah-doh-gwih ("Spear Hanging Down") (died 1806) participated in the American Revolutionary War on the side of Great Britain. Little Beard was one of the Seneca chiefs signing the Treaty of Canandaigua of 1794 that established reservations for the Iroquois. Arthur Parker (1881 – 1955) was born on the Cattaraugus Reservation in western New York, the son of Frederick Ely Parker, a Seneca Iroquois, and Geneva Griswold, a woman of Scottish and English descent, who taught school on the reservation. He was an archaeologist, historian, folklorist, museologist, and noted authority on American Indian culture. ↑ Fields and Mann, American Indian Culture and Research Journal 21(2). ↑ Decision and order United States District Court. Retrieved on October 22, 2007. 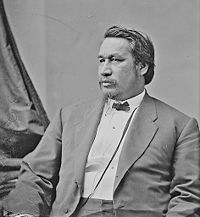 ↑ Ely Samuel Parker Nativeamericans.com. Retrieved November 18, 2007. ↑ A Narrative of the Life of Mrs. Mary Jemison. project Gutenberg. Retrieved April 15, 2008. This page was last modified on 6 September 2015, at 23:08.